The NEW and IMPROVED Animated Heroes Website! The Original Comprehensive Resource for the Heroes of Animated Films. Now Back and Better than Ever! We did it! 130,000 hits since 9 September 2005! NOTE: Sorry for the lack of correspondence for the last 20 months... I have been a little busy serving as a missionary for the LDS Church in Wisconsin. I anticipate returning home in March 2008, and then will have many updates. Please hold tight until then. I apologize for not making this known sooner! WELCOME, one and all to the new and improved Animated Heroes website. It has been YEARS since I've been able to access and update this website, but now I'm back and am looking forward to some real and exciting updates. This website (until very recently hosted here) will prove to be (hopefully) a helpful source of images and information about your favorite animated heroes! 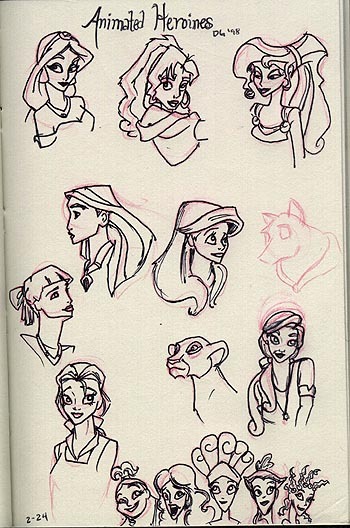 This page is based on the original Animated Heroines page, by Belle83210, and many thanks to her (it was her page that sparked the inspiration to start a heroes page!). Be sure that you visit her page, if you haven't already been there! At one time I also started to create an Animated Villains homepage (Link currently unavailable), but that has been lost to the void of cyberspace. This website is image intensive, so it may take you a while to get through it if you're on a slower connection, but I'm sure you'll find something that makes the wait worth it. If you would like to advertise for AnimatedHeroes.com on your website, click here for banners and instructions. Be sure to scroll down and sign the guestbook while you're here as well. As someone whose collegic study has been that of animation, I've spent many hours watching and analyzing animated films (it can get rather taxing... can't I just watch a movie without thinking about every little thing already??? ), so I'm going to provide a little insight and analysis about each character and the film in which they star. In the classic tradition of Animated Heroines, you can vote for your favorite hero. Vote on the voting page, and check out the results here. If you would like to link to my website, feel free to use any of the banners on the Advertise page. If you would like to link to a specific hero's page, you are welcome to use the buttons below, and the URL of the hero's page. Click here to check out the pictures my sister and I took on our recent Spring Break/college graduation trip to Disneyland! TOTAL dream vacation. 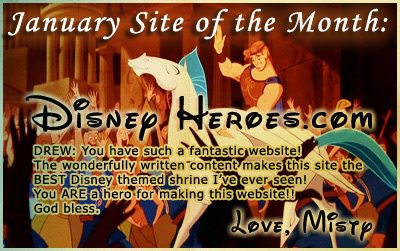 Again, a very special thanks to Disney-Dreams.net for awarding me their Site of the Month Award for January 2006! It's truly an honor. Email me at drew_graham1@hotmail.com with comments, complaints, corrections or suggestions for more heroes. 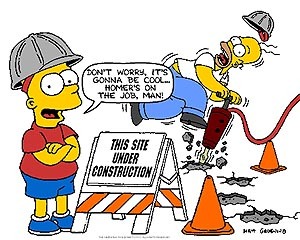 As indicated by Bart and Homer, this page is regularly undergoing a certain level of construction. Everyone's pages are up, however, so enjoy and check back regularly! Find out what's new here. Please come back soon and visit me, and before you go, be sure to sign my guestbook! The Animated Heroines Homepage, run by none other than the famous Belle83210. The original Animated Heroes website. The sequel: Animated Heroes, created and run by none other than myself, original page from 1998. 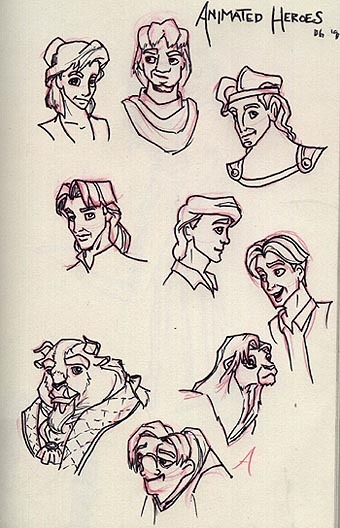 And because I'm a sucker for any way to get more traffic, this is my personal online Art Gallery, with loads of original drawings (Harry Potter, Disney, figure drawings, sketchbook samples, animation samples, etc.). Make sure you leave comments! Be sure to visit Lili's gallery! Check out her drawings of Harry Potter, A Series of Unfortunate Events, life drawings, sketchbook samples and random doodles, not to mention her incredible Photoshop work! It's more than a little obvious that I'm quite enamored of the Boy Who Lived and the woman who created him... Anyway, enjoy! The ultimate Harry Potter site for news and updates. DISCLAIMER: The characters and films cited on this page are property of Disney, Disney/Pixar, DreamWorks, WB, 20th Century Fox, Buena Vista Television, Tim Burton, Edgar Rice Burroughs, etc. respectively, and are used here without permission, and without any monetary gain. This is a fan site, folks, no profit to be made here. Want to advertise AnimatedHeroes.com on your website? Check out this page! Thanks a ton to Belle83210 for making these banners to post back in the day.